A project that aims to get more local journeys to be by bike, foot or public transport, has secured 70 electric bikes via a Government initiative. 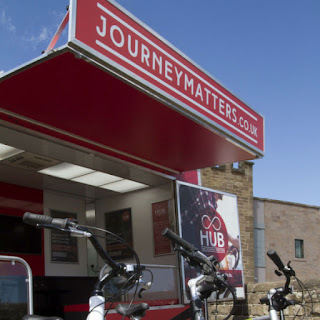 Journey Matters offers pedal and electric bikes to hire for people cycling to work, looking for work or who want to reduce the costs of commuting. CycleBoost operates "The Hub", travelling around the borough visiting various locations and businesses, providing a "one-stop shop" for everything to do with bikes, including repairs, cycle hire, riding skills and training as well as information and advice. The new Hub is being delivered on behalf of Rotherham Council by CycleBoost in partnership with Inmotion!. The scheme aims to promote sustainable travel and encourage more people to replace shorter car journeys by travelling by bike. Free pedal and electric bike hire is available for up to three months. This includes the free loan of a quality bike and all the equipment required such as bike lights, a lock and helmet to try cycling to work and for leisure. Bikes are maintained throughout the loan period and participants are fully supported with cycle training and route planning if required. At the end of the loan period participants can buy a bike from a local bike shop for a large discount off the normal retail price. South Yorkshire was awarded £4.8m from the Government's Local Sustainable Transport Fund 2 for 2015/16. This South Yorkshire-wide project aims to support economic growth and cut carbon through a range of sustainable transport measures. A major element of the bid included the promotion of cycling through the introduction of cycle hubs and services in the four South Yorkshire districts. The Electrically Assisted Pedal Cycle Sharing Pilot Scheme is the latest announcement backing the Government's commitment to double the number of cycle journeys by encouraging people of all ages and abilities to get on their bikes. Rotherham has secured the most bikes from a pot of £700,000 with 70 e-bikes to be made available to the public via the existing popular mobile hub, aiming to attract commuters who previously do not cycle. Transport Minister Andrew Jones said: "Electric bikes are a great way to encourage new people to get into cycling and today's announcement will provide an opportunity for thousands more to enjoy the advantages they offer. "Cycling helps cut congestion and is a healthy, affordable transport option. "We want to double the number of journeys made by bicycle. That is why we are also investing over the next five years in cycle training and infrastructure." The Hub has already proved popular in Rotherham. Jason White, facilities manager at Next Distribution at Manvers, said: "It really benefits our business. It provides a convenient and flexible service with a range of free cycling offers, all in one place, to encourage Next employees to cycle to work." Craig Burns, from Wolseley UK Ltd, builders merchants of Maltby, said the free bike hire scheme is "excellent". He said: "I would recommend it to anyone. I didn’t cycle before and I wanted to try an electric bike before I bought one. It has taken a while to build up my level of fitness, but now I cycle to and from work and ride at the weekend whilst out doing my shopping. I have cycled 1,000 miles and ride at least five times a week. Using an electric bike makes it easier to ride up hills, it gives you a boost along the way. My health and fitness has improved as a result of cycling. I've lost two stone, saved over £50 on travel costs each month and I am also doing my bit for the environment." In 2013, Bike & Go, a nationwide bike hire scheme, was made available at the redeveloped Rotherham Central Station, giving train users the opportunity to complete their journey on two wheels.